Bangkok, Thailand -- It is one singular word of his master that he has been following for over three decades. 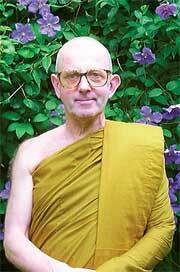 In 1977 Khemadhammo, a Briton already ordained as a monk, followed Ajahn Chah on what he initially thought would be a two-month trip to revisit his homeland, Britain. One day sitting on a train, the disciple consulted his mentor about how to respond to a request inviting him to serve as a visiting Buddhist minister at three prisons there. "Pai", or "go", was what the late Ajahn Chah uttered. "That was it. And I have been going to prisons ever since," said Khemadhammo, founder and spiritual director of Angulimala, a chaplaincy organisation that has introduced Buddhism to over a hundred prisons throughout the UK. For his dedicated service to prison inmates, in 2003 Queen Elizabeth II bestowed him with an OBE (Officer of the Most Excellent Order of the British Empire), and the following year His Majesty the King of Thailand granted him the ecclesiastical title of Chao Khun Bhavanaviteht, the second foreign-born monk to receive such an honour. On his recent visit to Thailand the monk, now 66, was invited to be a keynote speaker at an annual talk organised by SEM (Spirit in Education Movement). It was part of the Thai NGO's month-long programme to improve public understanding of people who have supposedly "gone astray", during which the venerable monk got the opportunity to meet and share his experiences, in a closed-door meeting, with Thai people who work with prison inmates and juvenile delinquents. Then he returned to England. And from the first three prisons he visited, over time his coverage expanded and the venerable Khemadhammo found himself visiting other prisons, following the inmates as they were transferred to serve their terms elsewhere. During the talk in Bangkok he recalled being teased by some of them as having to serve a "very long sentence." In the beginning the monk admitted to feeling uncertain in this new role: until then he had neither been to prison nor seen a prisoner. The closest he had ever come was, while still an actor, playing out a character who had been captured. Venerable Khemmadatto''There were differences but there were similarities. I too had been uncomfortable and it was my sense of unease that had led me to look beyond the then narrow confines that restricted me for answers. Yes, I realised, I did understand something about imprisonment,'' he conceded. Thus he set out to teach inmates Buddhism. With more lay practitioners assisting him, on Magha Puja Day in 1985, he founded Angulimala, now recognised as ''the official representative of Buddhism in all matters concerning prison service in England and Wales'', and there is an Angulimala Scotland, too. Khemadhammo disclosed that there are about 50 Buddhist chaplains in Britain who come from different schools of Buddhism. ''In Angulimala we work together very well'', a phenomenon which is note-worthy in itself, added the monk who also serves as a Buddhist Adviser to the Prison Services Multifaith Chaplaincy Council. It may come as a surprise to hear him espouse the value of these precepts that many Buddhists have taken for granted. In particular he ventured how the fifth might be the most important: if you break it, you can break all the rest. A number of inmates he has met committed terrible crimes and had their lives altered tragically just because they used alcohol and drugs. Why do people commit crime anyway? Is it because of anger, greed, or destitution? He argued the punitive approach - based on the principle that if you hurt someone hard enough, then they won't commit wrong deeds (again) - has been proven it doesn't work. Often, people emerge from prison angry, having no home, money nor family and thus are ready to commit more crimes. Accepting that one cannot stop governments from pursuing their policies, through the Angulimala project, Venerable Khemadhammo and his team have sought to provide an alternative avenue for inmates to do something ''useful and constructive''. They learn how to meditate, to watch their mind and come to terms with themselves. Since the early '90s, thanks to an Angulimala initiative, a handful of prisons in England have allowed the setting up of a ''Buddha Grove'', an area open to prisoners from all denominations to do contemplative work in a quiet, peaceful ambience. ''When it is suggested that I was involved in some kind of Buddhist social action, I'd rather reject that term. I think I am just doing my duty as a Buddhist monk. I feel Buddhism is an amazing teaching and practice. I have had the good fortune to come to Thailand and practice with Luang Por Chah. He once said [to me] 'everything is your practice'. ''What I've been doing with people in the prison is the same as what I do anywhere. When we teach Buddhism, we are trying to offer people a way to end their suffering, a way to deal with kilesa [desire] that brings suffering. ''Of course, people in prison can't come to the temple, so we have to take the temple to them,'' he said. Like the poignant tale of serial killer-turned-monk Angulimala (see sidebar), the venerable Khemadhammo believes that people can _ and will _ change if given an opportunity. Apparently, he never tires of retelling again and again how Buddha, through his compassion, was able to transform a supposedly evil man without resorting to force. Likewise, in his years of visiting prisoners, he said he has observed some of the so-called ''most notorious and dangerous people'' showing kindness to their fellow inmates, be it to share milk or sugar (which is akin to ''gold'' in such places), or to raise funds to help those family members who need to undergo surgery. ''I think it is very important that we let go of that tendency to make judgements and realise that people are very complex. None of us are just black and white; everyone here has some good things and not very good things. We do unpleasant things. We get angry, jealous, upset, we act on impulses. ''I hope you will learn not to attach to views or opinions, especially the views and opinions about other people. Give everyone a chance,'' he concluded.